- my son makes full use of all the different sounds and textures, he’s two years old now and still shows huge interest in the toy which I think is pretty impressive. know my son loves this too as when he’s tired he seeks this toy out and rubs his face with it in as he would a comfort blanket. 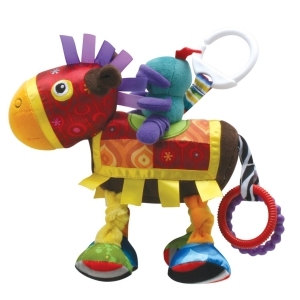 Sir Prance-a-Lot is suitable from birth and Lamaze give a maximum age of two years. It’s so beautifully and cleverly rendered however that I wouldn’t say an older toddler wouldn’t love it, although only younger babies will really get the most from it regarding the learning aspect - my son mainly likes to cuddle it these days, but as a baby would spend ages crinkling the feet and just exploring the different facets of the toy. son and remains in immaculate condition. It’s not machine washable but the fabric is hardy enough that you can give it a good wipe over if it gets dirty or has milk or food spilled on it - it doesn’t seem to matter if you get it very wet either as it dries quickly and evenly over a hot radiator. I not only recommend this as a great toy for your own child, but it makes an excellent gift if a friend or relative is having a baby. The Lamaze brand is much loved and Sir Prance-a-Lot is a really sweet and unusual looking baby toy which has been adored by my son despite the fact he has more exciting things in his toy box.